ST. LOUIS - Sarah Collier cried. It was late May 2015 and she had finished helping her 18-year-old daughter, Napheesa, move into her dorm room at the University of Connecticut. When it was time to leave Napheesa behind and drive to Boston to catch her flight home to Missouri, she needed her car’s windshield wipers for the rain outside and for her eyes inside. “It was hell,” Sarah said. The emotions returned Tuesday night when Napheesa Collier returned to The Show-Me State to show her hometown fans she’s grown into an outstanding young woman and into one of the best basketball players in the country. Any tears from her mom will be filled with pride. It was Homecoming Day for the Huskies’ senior when No. 1 UConn took on Saint Louis University at Chaifetz Arena. A group of 300 family and friends was part of the largest crowd - by far - of the young season for the Billikens. The 6-foot-1 forward and resident of St. Louis suburb St. Charles came into the game averaging a double-double (18.0 points, 10.6 rebounds) and came off her career-best third consecutive double-double (16 points, 15 rebounds) in UConn’s impressive 89-71 pounding of then-No. 1 Notre Dame Sunday. Her family - parents Sarah and Gamal, and younger brother Kai - made the trip to South Bend for the game. Now they’ve welcomed her home. Napheesa was born in Jefferson City, Missouri. Her favorite player is another UConn star and native of Missouri’s state capital - Maya Moore. They got to meet when Napheesa was a freshman playing at Jefferson City High. The family moved to St. Peters near St. Louis when she was 15 and Napheesa transferred to Incarnate Word Academy in the city. Under coach Dan Rolfes, she led IWA to three consecutive state championships and emerged as one of the top recruits in the Class of 2015. But how good? All doubts were removed when UConn coach Geno Auriemma made a phone call. Sarah thought Napheesa might stay near home as the University of Missouri recruited her daughter hard. Notre Dame was also in the picture and the Irish were just a five-hour drive away. Then there was Maryland and UConn. Napheesa made an official visit to Maryland. Then on Easter Weekend of 2014 she joined Katie Lou Samuelson, De’Janae Boykin, and Haley Gorecki on a visit to Storrs. By the time Napheesa was ready to come home, she decided that there would be no more trips and committed to UConn. Two months after finishing her career at IWA as a three-time state champion, a two-time Gatorade state Player of the Year, and as a consensus All-American as a senior, Napheesa and Sarah traveled to Storrs for the start of summer school. Only one went back home at weekend’s end. “All I could think of is that I just dropped my daughter off 19 hours away from us and what am I going to do,” Sarah said. “I laugh about it now. But, really, I did not want to let her go. Gamal kept saying, ‘It will be fine. She’ll be fine.’ It’s been fine. It’s also been tough. Napheesa’ freshman season ended with the Huskies winning an unprecedented fourth straight national championship. Her sophomore year was one that compares with the best in UConn history. She averaged 20.4 points and 9.1 rebounds and shot 67.8 percent from the floor and was the American Athletic Conference’s Co-Player of the Year with Samuelson and a consensus first-team All-American. She was the Most Outstanding Player of the NCAA Bridgeport Regional. But the Elite Eight victory over Oregon where she also netted her 1,000th career point was the last of the 111-game winning streak. The Huskies fell to Mississippi State in overtime in the Final Four semifinals. A solid junior season ended in a similar fashion when Notre Dame’s Arike Ogunbowale hit a jump shot over Collier’s outstretched arm to give the Irish an overtime victory in the national semifinals. Her 24-point performance in defeat, though, did earn her a spot on the all-Final Four team. As a senior she’s emerged as a leader with Samuelson and Crystal Dangerfield and the Huskies have started strong as they seek a 12th straight Final Four berth and 12th national championship. Collier has played in 119 games at UConn and the record is 117-2. One thing that never changes is her expression on the court. One look at her and it’s hard to tell whether she has 20 points or two, or whether the Huskies are up big or are struggling. “Gamal told her a long time ago to never let your enemies see your emotions,” Sarah Collier said. “Napheesa looks for that in an opponent and when she sees it she goes right at it. Sometimes people see that as being unemotional but on the court she’s taking care of business. Off the court, she’s funny and she laughs a lot and she gets me to cry. Napheesa Collier entered her homecoming game with 1,735 points and 882 rebounds and on pace to become the fifth member of UConn’s 2,000/1,000 club. While her IWA No. 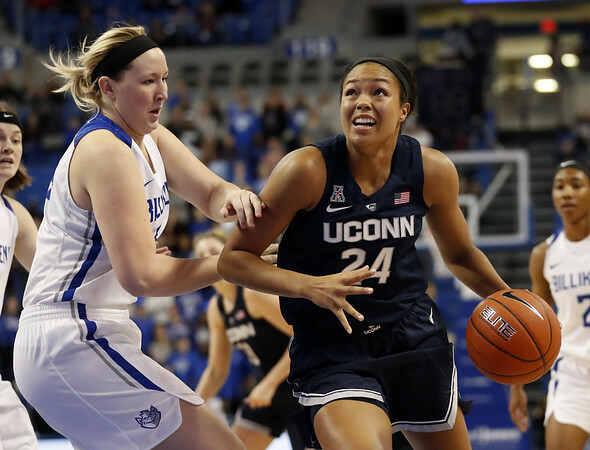 24 was retired Monday night, her name and number will also be placed on the wall at Gampel Pavilion in the Huskies of Honor on her Senior Day, March 2. Last week, she was named to a list of 30 candidates for the Senior CLASS Award and she will graduate in May with a degree in human development and family studies. She is projected to be a first-round pick in the WNBA draft. “I have knots in my stomach every single game until they close it out,” Sarah Collier said. “Napheesa has such high expectations and goals for herself and I just pray that she can reach them. Posted in The Bristol Press, UConn on Tuesday, 4 December 2018 21:06. Updated: Tuesday, 4 December 2018 21:09.